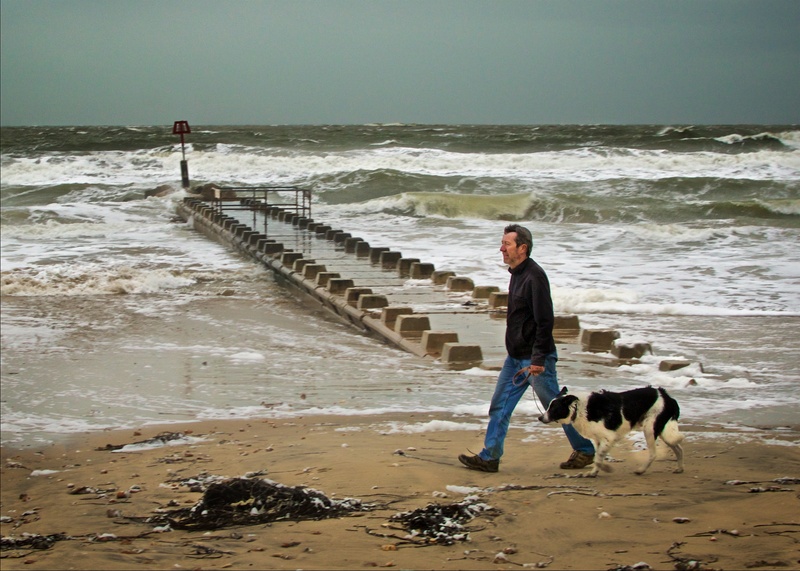 A man takes his dog for their morning constitutional in stormy weather on Bournemouth Beach, despite it being Christmas Day. The weather didn’t seem to put people off, with many people walking off the Christmas pud on the beach, and at least 750 jumping in the sea for a charity swim first thing. The charity swim was in aid of the Macmillan Cancer Charity, and has been covered in a different post, here, and on YouTube here. In the summer, Bournemouth beach is usually classed as one of the best, if not the best in the UK, and the fourth best beach in Europe. But even in the depths of winter, it still draws crowds, more usually locals, as it has a savage beauty all its own, even inn the most inclement of weather.